Vegetation rooms are ideal for existing growers that already have a grow room and are looking to increase harvest times by growing younger plants to prepare for transplant and rotation into a flower room. This monster 4x8 Vegetation kit is the perfect option for growers looking to compliment an even larger flowering room. This kit comes with all the essentials; lighting, fans for ventilation, carbon scrubbers, light timers, ducting, and many upgrade options. The only thing not included is soil or nutrients as many of our customers prefer to source soil and nutrients locally for reduced pricing. If you want a hydroponic veg kit check out the other hydroponic veg kits available on our grow tent kits main page. The DARK ROOM II is specially lined with 95% reflective hammered effect mylar fabric (210D), to increase light intensity and improve light distribution. 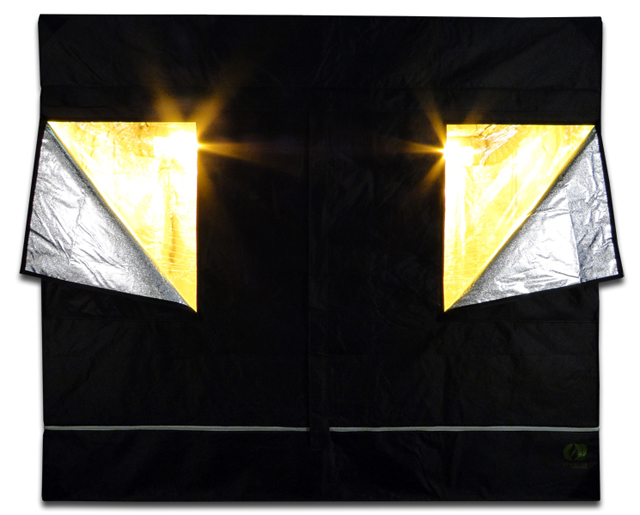 Light-proof, waterproof and pre-equipped for extraction and ventilation, the tents come with equipment bars to support lamps, and carbon filters. Openings at both the back and front of this tent make it easy to move and access your plants to better care for them in their vegetative state. 600W Interlux Super Metal Halide Bulb- Metal Halide bulbs like this one feature a more blue spectrum of light than high pressure sodium (HPS). This blue spectrum is used specifically for growing plants in their vegetative stage, making this lamp ideal for a veg kit. Giving your plants the right type of light during specific growth stages allows them to grow strong and produce maximum yields. This bulb will work with any electronic ballast like the one included in this kit, and features a 1 year warranty. Air flow is an essential component in any horticulture configuration. These fans can be used for filters, intake, or exhaust. This durable and high quality 6” fan is powerful enough to air cool several lights connected by ducting and powerful enough to extract odor and heat from your room. Keep your growing environment in balance by ensuring you have proper ventilation. 2 Fans are included with this kit, 1 for pulling air through the included air-cooled reflectors, and another for exhausting stale air out of your tent through your included carbon filter. This Veg kit comes standard with everything you need to veg your plants before moving them to a flowering chamber, but these upgrades can help you bolster and speed up your vegetative growth for larger end yields and faster turnaround times. The K3-L600 Veg light from Kind LED is without a doubt the best veg LED on the market. Years of testing, research, and developement have produced an LED with a proprietary spectrum focused on vegetation that is capable of growing bushy plants with tight internodal spacing while reducing energy costs by nearly 50% from other lighting options and producing virtually no heat. Using this LED marvel in the Veg kit also removes one of the in-line fans from the equation, making a quieter and even lower energy consuming kit. The LED upgrade for this 4x8 Veg Tent Kit comes with 2 K3-L600 Veg LEDs. Need/want a tent that is taller? No problem! The 4'x8' Gorilla Grow Tent is height adjustable and can go from 6'11" high to 7'11" or ever 8'11". Need/want a tent that is smaller? No worries there either! Gorilla tents are also available in the shorty style to help growers that don't quite have the height they need for their tents. Gorilla Grow tents are by far the highest quality tent on the market, so if you want the top of the line, this is the tent for you. Featuring 1680D fabric that is up to 9x thicker than other tents, strong steel interlocking poles, and monster zippers, this grow tent is extremely durable. If you are starting from seeds or cuttings you may want to propogate them before they are ready for the vegetation tent. This upgrade gives you everything you'll need for growing those young plants up into adolesence. With the 4'x8' Veg Tent Kit, you can choose from 1 or 2 germination package upgrades for up to 144 plant starts at one time. All of our grow rooms are built to order. You may pick up a grow room locally if you are near our shipping facility. There is no charge for picking up your grow room from the manufacturing facility and you will not have to pay for shipping. Contact us for more information. Processing / Manufacturing Time: 2-3 Business Days. All orders are processed in the order they are received and additional delays can occur in rare circumstances. Shipping Time: 3-7 Business Days depending on destination; Up to 15 business days in rare circumstances. Assembly: Minor assembly is required. This includes: Screwing in the lightbulbs, assembling the tent, plugging in cables, adding water, etc. Shipping Method: Freight - Grow Tent Kits are primarily shipped through a freight company, some items may come in separate packages through other carriers (FedEx/UPS). Packaging Materials: Grow rooms are discretely packaged. Shipping Destinations: We only ship to the Continental United States. Please contact us for shipping quotes to other destinations such as Alaska, Hawaii, And Canada.